To me, the beauty of this sauce is in its 4-ingredient simplicity. Raw ginger has a kick to it and scallions have that onion-y bite. When combined with sizzling oil and some salt, the flavors balance each other out nicely. Poached chicken might sound like the blandest thing on earth, but here it serves as a juicy canvas for the sauce (read below for tips on perfect poaching). Today’s post is a slightly healthier modification of this traditional Cantonese favorite. 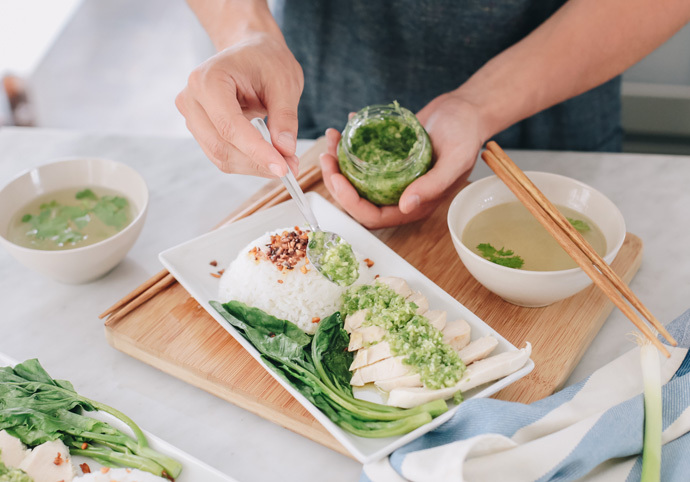 Typically, the dish involves a whole poached chicken, and the sauce is very oily and salty, with ginger and just the white parts of scallions. My mom’s version subs in grapeseed oil (in a much reduced amount), and we use skinless chicken breasts or thighs. After poaching, you also end up with a light chicken broth with hints of the aromatics – it’s soothing to sip, or you can repurpose it in other dishes! ** I started using a food processor, which reduces ginger & scallion chopping time down to 2 minutes! I use and love this Cuisinart set with multiple attachments. With a food processor, be sure not to over-process / chop the scallions too finely otherwise the sauce won’t have any texture. Step 1: Put the chopped scallions and minced ginger (with the ginger on the top, so the hot oil will sear away some of its spiciness) into a heatproof bowl and sprinkle the salt on top. Step 2: Heat the grapeseed oil in a skillet or saucepan over medium-high heat, then pour it into the bowl, letting the oil sizzle over the other ingredients. Mix well; the ginger and scallions will emit some water as everything settles. I usually let the sauce sit at room temperature for up to an hour so the flavors meld thoroughly. You can then toss this mixture with noodles (love it with flat egg noodles) and serve with a fried egg on top, or follow the steps below to serve with chicken! We added a little side of veggies and rice topped with garlic chips. Step 1: Put chicken into a lidded pot just large enough to hold it and the aromatics. Add just enough cold water to cover everything. Step 2: Bring the water to a boil. Once it boils, reduce the heat to low and simmer for 5 minutes. Step 3: Cover the pot and turn off the heat. Let stand for 30 minutes without opening the lid. Remove the chicken from the pot after the 30 minutes (test doneness with a food thermometer if you have one), slice, and serve. For a light chicken broth with a hint of ginger, skim the foam and impurities off the top of the poaching broth and add salt to taste. Enjoy! I love love love your photos Jean! They’re always so cute! Also, this recipe sounds amazing! I’ll have to give it a go! Yummm! Cannot wait to try this myself. Thank you so much for sharing your family recipe! Hi Hannah! It was a Marshalls / Homegoods find. They always have some good stuff in the kitchen section.. it’s as black hole for me there! Wow I don’t even like ginger and I want to try this! I’ll let you know how mine turns out! I love scallions! I must try this recipe. Thanks for sharing, Jean! i love these segments – you should make a spinoff blog for extraappetite! You look great in your at home tee outfit ! I no nothing about Asian cooking but am learning and I will add this recipe to my repertoire! My mom makes this too I am trying to convert her from vegetable oil to avocado oil. Interesting! I haven’t tried avocado oil … does it have a distinct flavor? I can’t wait to try it, especially since I’m obsessed with poached chicken. Btw, is there anything that Nick can’t do?! Haha in all fairness, anyone can make this one ; ) How do you usually eat your poached chicken? I’m trying to find more ways to make use of that healthier style of cooking it! When I lived in England I frequented a Chinese restaurant that offered a “cold” chicken salad type dish. This recipe for both the sauce and the chicken makes me think of that dish. I will definately try this. It may “take me back” to that delicious flavor. Thanks! Yum… do you remember what that restaurant was called? I’m curious to look up some pictures of this cold chicken salad type of dish to see what it was! My grandma makes this the same way too! 😀 Love how it tastes! Thank you so much for sharing this great recipe, love! Can you do a post about Lafayette 148’s petite work clothes? The size chart indicates the petites are about 1 inch smaller in all dimensions. It looks like professional work attire that if styled by you could be really cute. Would love to see what some of the options look like. Hi Hilary – I’ve only tried their pieces a few years back and they ran pretty generously and were shapeless on me. If I come across them again in the near future and things have changed for the better, I’ll keep you guys posted! This looks amazing! Pinned to try this later. Hi Shannon ~ let me know how it goes and what you decide to serve it over! this combo is absolutely one of my favourite things to eat. i can’t stop myself from mixing the spread into rice, so good! I always make a variation of this at home! Well, my mum does – I just eat it. So yummy! Loving this recipe so much! A taste of home! I’m a *little* bit horrified/surprised you did not chop off the roots of the scallions before using them as aromatics for the poaching broth! I’m sure the roots were washed thoroughly, but it’s like the one part you don’t eat on a scallion, so I would never even think to leave it on. Also, saw your IG post/story with scallops (food, not scalloped edges on clothes, ha! ), and a different flavor you could do with that is a garlic and soy sauce. It’s almost the same idea as the ginger scallion sauce, but with scallions and garlic chips in oil, no ginger, and a dousing of light soy sauce over it. It’s pretty Chinese-style to do scallops that way, but thought you might want to try it! Thank you for the scallop suggestions! Sounds amazing, cant wait to try it! I made this last night and it was so good. I grew up eating this but somehow forgot about it. The poaching liquid was really flavorful too. I love seeing you cook on IG stories. Really happy to see the recipes get their own post here. Thank you so much! Hi Jean! I love when you post recipes. I made this and it was delicious! Do you have any suggestions for peeling the ginger root? That was pretty time-consuming and what I thought was a large amount of ginger quickly shrank. I have very little experience cooking with fresh ginger and usually not such a significant amount. Thank you for any tips!